Ink-jet printing is being widely used and seriously considered for dispensing and printing a variety of materials. It can reproducibly dispense spheres of fluid ranging from 25 to 125 ?m in diameter (8 pL to 1 nL) at rates up to 25 kHz on-demand, and 1 MHz for continuous droplet generation. Piezoelectric dispensing technology is suitable for a wide range of material dispensing, such as liquid metals, dispersions of metal nanoparticles, electrical, and optical polymers, sealants and adhesives. The digital nature of the technology has many advantages over more conventional, subtractive and analog processes. Ink-jet-based printing requires no tooling, is noncontact and is data driven: no mask or screens are needed and the printing information is created directly from CAD or similar formats and stored digitally. It is also environmentally friendly being an additive process, generating little waste. In this paper it will be shown how ink-jet printing could be used to create electrodes, deposit electrocatalyst, print polymer electrolyte membranes and apply sealants either as glass frits or adhesives. 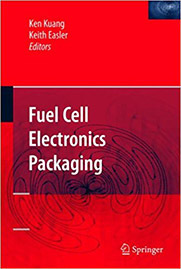 Some of these applications have been demonstrated for fuel cells and others have been used in related microelectronic devices.